In the 1990s, 20-something Hill scours video shops for noir classics and when caught watching the vids at home has to explain his abnormal behaviour. Twenty years on, are we noir lovers to be even more pitied or have the hipsters caught up with the joys of black and white crime films? From talking to today’s 20-somethings at work, it seems some cannot bring themselves to watch a film shot in monochrome (white being the one colour, for the pedants among us.) This is a clash of snobbery for those of us who think the colorization of film noir is sacrilege. One advantage we B&W voyeurs today have over Steele Hill of the 90s is we can watch films noir which have passed into the public domain for free on the internet. I use a HP ENVY 23 All-in-One Desktop PC to deliver pretty pictures of the grim scenes of noir. The Bang and Olufsen speakers provide a bass-rich sound which renders the mood of the films nicely. I am sure another variety of PC, a notebook or tablet would deliver to you a reasonable version of your chosen classic. Not so sure about a Smartphone as a medium. Maybe some readers might enlighten us. Those who like them know what a film noir is though the professional arguers are still arguing whether it’s a genre 50 years after French critic Nino Frank bestowed the moniker black film on stylized Hollywood crime films. So we will leave the arguers to discuss it out among themselves while we watch some classic films noir to see what they indeed are about. We start with a bewdy, not one of the most famous. I will put the link down the bottom of this post so you don’t go leaving me mid-thought. 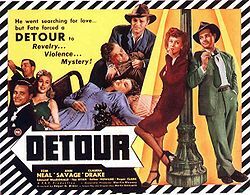 Detour is a 1945 movie based on the Martin Goldsmith novel of the same name. Edgar G. Ulmer directs. Ulmer was among a group of European expats including F. W. Murnau, Robert Siodmak, Billy Wilder, Fred Zinnemann, Otto Preminger and Fritz Lang who came to Hollywood, most bringing the sensibilities of German Expressionism with them. Ulmer’s rollecoaster tale could of itself made a good film noir. He came to Hollywood in 1926 to assist in art direction on a Murnau film. Ulmer worked his way up through a couple of B-graders to direct the fabulously successful 1934 horror film The Black Cat, starring Bela Lugois and Boris Karloff. 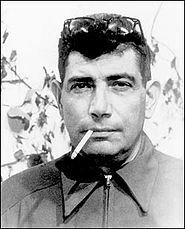 Ulmer then worked his way down the Hollywood ladder after an affair with an actor married to the nephew of a studio head. Ulmer won the fair maiden who divorced her husband and married the director. Their wedding present was to spend the next 35 years making B-grade films many for the atmospherically name Poverty Row studios of Hollywood. 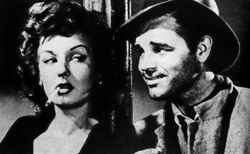 The best of them was Det0ur which stars Tom Neal and Ann Savage. Neal lived a turbulent life which included the vicious assault of love rival Franchot Tone.and six-years’ jail for the manslaughter of his third wife Gale Bennett. Co star Savage dismissed his off-screen personality as child-like but his was a dangerous case of arrested development. Post Detour, Savage lived a relatively normal life which included more B-films, television, work outside acting and attaining a pilot’s license. Although Neal is competent in the lead, Savage steals the show as femme fatale Vera. I know. I know. What sort of name is Vera for a femme fatale? Mine in the novel Iraqi Icicle http://bentbananabooks.com/ is Crystal Speares. Now that’s a nom befitting a femme fatale. Savage has the film's best dialogue delivered in a cynical style which Bogart would have been proud of. Detour has all the signature camera-work of a noir. The blacks, greys and shadows are punctured by focused light. There is a classic unsettling scene which will remind you of the flippant adage that in noir it is always night and always raining. Trick shots from low angle and wide keep the suspense high-pitched and the viewer admiring the compulsion of scenes. A low budget can inspire creativity. The story is set in a compressed timespan typical of the novels which inspired film noir. Detour was inducted into the United States National Film Registry in 1992. Here is our song from Little Willie John who lived and died a noirish life. Labels: Ann Savage, crime, Detour, film noir, Iraqi Icicle, noir, Steele Hill, thriller.